Please read these Terms of Service (“Terms”, “Terms of Service”) carefully before using the this website (the “Service”) operated by The Australian Ceramics Association (“us”, “we”, or “our”). Your access to and use of the Service is conditioned on your acceptance of and compliance with these Terms. These Terms apply to all visitors, users and others who access or use the Service. By accessing or using the Service you agree to be bound by these Terms. If you disagree with any part of the terms then you may not access the Service. The Australian Ceramics Association warrants that the information contained in this website is correct the time of publication. Prices and details of all items are subject to change without notice. 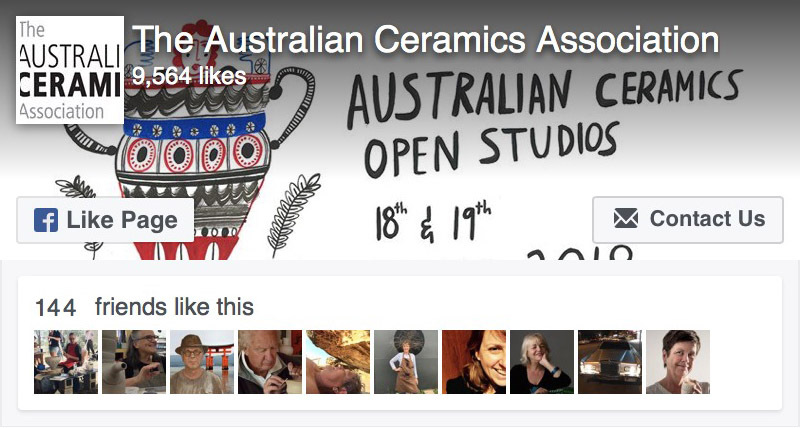 Please contact The Australian Ceramics Association for latest updates. This website is intended to provide information of a general nature, and should not be relied upon as specific advice for individual users. The Australian Ceramics Association makes every effort to maintain the currency of information in this website, but accepts no liability for any reliance placed on information herein. *All items are displayed inclusive of the current (Australian) GST tax rate. Items purchased by overseas customers are not subject to GST and are displayed exclusive of taxes. By using the Stripe Checkout service, you agree to be bound by these terms and conditions. You can cancel this order within two weeks after we have received it. You can return new, unopened items from a cancelled order within 2 weeks after delivery. Items should be returned in their original state and packaging. For more information on cancelling orders and returning items, see the Our Returns Policy. This website uses some cookies. They contain information that is of a statistical nature only, assisting the user experience and is not able to identify individual website users. Information collected will not be used for unauthorised purposes such as email lists or junk email. Information submitted to The Australian Ceramics Association via this website is only used for the purpose for which it is submitted. Information in application forms is used by The Australian Ceramics Association strictly in confidence. Information will not be disclosed to any other third parties. Information submitted by users to The Australian Ceramics Directory listing is done so voluntarily and the Australian Ceramics Association accepts no liability for any reliance placed on information therein. Registration to the Australian Ceramics Directory automatically gives copyright permission to the The Australian Ceramics Association to publish registrants image and details on the Directory listing. The Australian Ceramics Association reserves the right of discretion in regard to the acceptance of applicants listing content submitted to the Directory. Must hold current membership/s of The Australian Ceramics Association (TACA). All participating artists (or groups) must have public liability insurance with a valid Certificate of Currency, detailing cover for the dates of the event. Certificate of Currency must disclose the TACA member’s name (single person or group). Note, those who have TACA Group Liability Insurance are covered for this event. Pay an applicable Participation Fee after submission of an EOI form. Our Service may contain links to third-party web sites or services that are not owned or controlled by The Australian Ceramics Association. The Australian Ceramics Association has no control over, and assumes no responsibility for, the content, privacy policies, or practices of any third party web sites or services. You further acknowledge and agree that The Australian Ceramics Association shall not be responsible or liable, directly or indirectly, for any damage or loss caused or alleged to be caused by or in connection with use of or reliance on any such content, goods or services available on or through any such web sites or services. We strongly advise you to read the terms and conditions and privacy policies of any third-party web sites or services that you visit. The Australian Copyright Act 1968 (the Act) allows 10% of the number of words on this website to be reproduced and/or communicated by any educational institution for its educational purposes provided that the educational institution (or the body that administers it) has given a renumeration notice to the Copyright Agency Limited (CAL) under the act. For details of the CAL licence for educational institutions contact: Copyright Agency Limited, Level 15, 233 Castlereagh Street, Sydney, NSW 2000 on phone (02) 9394 7600 or email info@copyright.com.au. Except as permitted under the Act (for example for the services of the Crown or in reliance on one of the fair dealing exceptions i.e fair dealing for the purposes of research or study) no part of this website may be reproduced, stored in a retrieval system, communicated or transmitted in any form or by any means without prior written permission. All inquiries should be made to the copyright owner at The Australian Ceramics Association (a company limited by guarantee; herein after called The Australian Ceramics Association).